April means... Simply Charming Every Other Month Mini Sew Along! Many of us in the Midwest welcome April's arrival, with the hope that spring, as we all remember it, actually occurs sooner, rather than later! A few days with temps approaching the 60 degree mark have teased us well enough... it's time for the real thing to stop flirting with us, and make a commitment to arrive, and stay! If you are joining Darlene and I in our Simply Charming Every Other Month Mini Sew Along, it's time to make another mini from Tara Lynn Darr's Simply Charming book. I choose Nellie's Nine Patch, and used a charm pack of Indigo Crossing, by Minick and Simpson for Moda, for the majority of my quilt. A few finds among my scraps filled in nicely for some of the larger blocks, in soft whites and ecru tones. I like to keep my machine quilting very simple! Finished size 15" x 18"
Darlene and I would love to see the mini you are making for the month of April. You can link below... you will have until May 5th. Please link to the post in your blog that features your finished mini quilt. Send me an e-mail if you have questions about how to do that. I'm referring to Spring! Central Iowa still has a little snow on the ground in my neck of the woods. Predictions of temps in the 50's - 60's for the weekend are highly anticipated. No one wants to see kids wear winter boots for an Easter egg hunt! Fingers crossed!!! I did a little decorating to celebrate the arrival of the Easter holiday. I'm keeping it simple... again. ground the tree in it's place. it's an old Buttermilk Basin design. I wasn't very busy in the sewing room this past last week... there's just a lot going on that doesn't allow much time to play with fabric! I did manage to applique the clothes poles on the pattern below. I started this project while at retreat... the plan was to have it finished before the end of March for my CTTY project. I don't think I'm going to make the deadline... but I can live with that! A pieced and appliqued wall quilt. I'm doing the applique using the needle turn method. I usually machine applique, and I have to admit, I'm enjoying this hand work! It's a great way to relax after a long day at work. 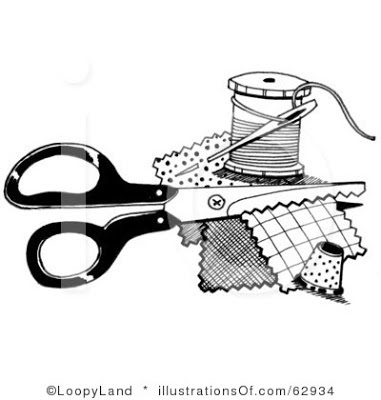 What is your favorite method of applique??? Oh what a retreat it was! The fastest three days of a week? The very ones spent at a quilt retreat! Don't you agree? The THREADS quilt group I belong to has held a spring retreat for the past five years. We don't travel far... the retreat is held at the home of one of the members. Here are a few pictures of the projects that kept this years attendees busy! group project due in September. resulting in a gorgeous flimsy of baskets! Diana finished machine applique on a basket block. Nor made this Jan Patek beauty. This is one of three projects I worked on. Life is crazy busy, and I need to catch up on reading all of my favorite blogs. I don't want to miss a thing!!! I've taught my daughter well!!! On a Sunday afternoon about a week ago my daughter had a few hours all to herself. My son-in-law was left to entertain the kids while daughter headed to the state fair grounds for the last hours of a flea market. I was at home, engrossed in a book, when Kelly called to tell me she stumbled on something she was pretty sure I would be interested in. Using her smart phone, she snapped a picture of an old, metal clothes drying rack and sent the pic to me. Yep... I knew exactly what I would use it for! The price tag said $45.00. I was interested, yes, but not for $45.00. I told her to ask the gentleman manning the booth what would be his best price, but told her not to pay more than $35.00. With those instructions, we hung up. Fifteen minutes later, Kelly called and said she was heading home, but she would be stopping by to drop off my clothes drying rack first. It was late in the afternoon, the flea market was shutting down, and the gentleman gave her a great deal. I happily wrote a check to Kelly for $25.00! And this is how the clothes drying rack looks today! Yep! I taught my daughter well! Shortly after my first blog in July of 2012, I joined the FRIDAY NIGHT SEW IN group, hosted by Heidi, of Handmade by Heidi. Occasionally, Heidi has a give away for the Sew In participants. How very sweet and generous of her! This was the case with the February 2013 Friday Night Sew In... and, how lucky am I! Heidi crocheted the cute mug cozy. (Visit her blog to see how crazy she went making these cuties... and she has a link for the pattern! Heidi posts some great recipes, too!) AND... a charm pack of Fandango! I love the bright colors and geometric patterns in this fabric line... perfect for a summer table topper! Thank you Heidi... and thank you for hosting FRIDAY NIGHT SEW IN!!! I'm sure I speak for all the participants when I say, "we appreciate it!" We keep simple rules for our group project... and we don't get bent out of shape if the rules get broken. The main criteria for this project was to use fabric from our stash... make the quilt without purchasing any fabric. Here are the results! Jacque used a charm pack of SEW MAMA SEW. 10" squares. The approximate size is 28" square. quilt... as you will see in the next picture. (Thank you Aunt Helen... rest in peace). Unable to attend our meeting, Carole showed her Confetti Cake quilt to a few of us about 3 weeks ago, knowing that she would be in Texas, and the quilt was going with her... a gift for her daughter. What really shocked us is that she had it done 3 weeks early! BJ wasn't able to join us Monday evening... but we are all looking forward to seeing her Confetti Cake quilt at our April meeting. Don't forget BJ!!! Did you notice that we used the same pattern, but Nor's and Patricia's looked totally different than the rest of ours??? If you look carefully at the picture of the pattern, you will see shading around each of the triangles in the individual blocks (before sewn together). Nor and Patricia cut and pieced their blocks according to the shading. Jacque, Aimee, Carole, and I cut and pieced our blocks randomly. Two different interpretations... two totally different looks! It's all in the eye of the beholder... there isn't a "right" or a "wrong" when it comes to some quilt patterns! ... an adaptation of Grannie's Scrap Box, the first mini quilt shown in Tara Lynn Darr's book, Simply Charming - Small Scrap Quilts of Yesteryear. Before I go into the details of who made this cutie, I must tell you that the idea to adapt the quilt as a flag came from another blogger, who used Tara's pattern as her inspiration to create the same. Unfortunately, I can't remember who it is! If it's you, and you posted about your flag in early February, please identify yourself in a comment, so I can give you credit for the inspiration that you have been to others!!! And, if you would like, please link your post featuring your flag quilt here, so everyone can see it! (Update, 8:45pm CST... I just heard from Carol at Carol's Craft Blog. She is the talented lady who created the mini flag quilt using Tara's Grannie's Scrap Box as her inspiration. Thank you Carol! Click here to see Carol's flag). Okay... back to the flag in the picture. The person behind this quilt does not have a blog, but I know her very well! 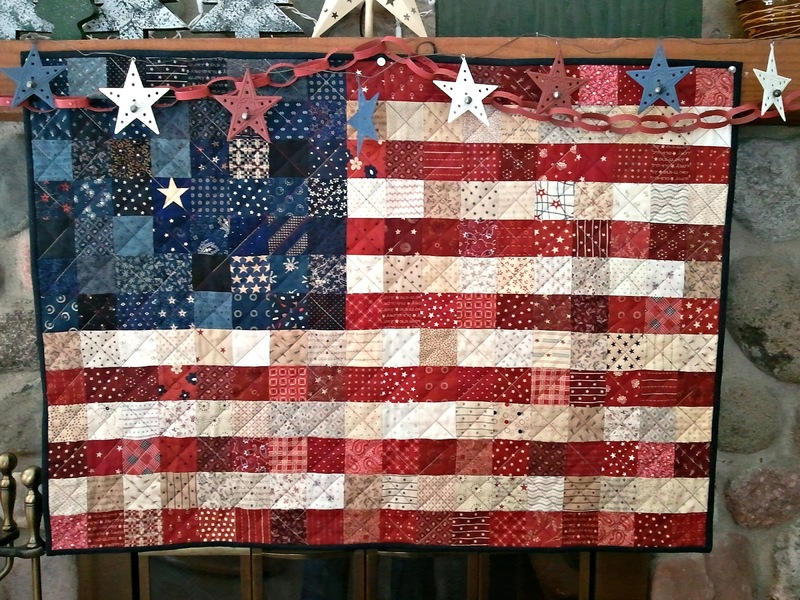 The flag quilt was made by my sister, Mary Jo. My sister has had the talent of sewing for many years. She excelled in Home Ec sewing... making most of her clothes for her career after high school. A few years ago, after a long absence from a sewing machine, Mary Jo took a quilting class at her LQS... and she's been smokin' the motor on her Viking Sapphire 875 ever since! "I'm very glad I decided to participate in the Simply Charming Sew Along, even though I don't think I'm a very good scrappy quilter. After seeing pictures of patched American Flag quilts on Pinterest and in blogs, I dug into my red, white, and blue scraps and started cutting. I used 2.5" squares, making 7 red rows, and 6 white rows, just as the 13 rows in the American flag. There are 18 vertical rows of squares. The finished size is 26" x 35". I'm very happy with how it turned out! I'm looking forward to selecting another mini quilt in the book for the April sew along!" Skinny mini... and a mini in progress! My skinny mini, as I call it, is a completed project. I don't enjoy hand quilting... (I admire it, but I don't enjoy doing it), so my machine quilting was kept simple. block pattern, courtesy of Pam Buda. You can find it at Pam's blog, here. Finished size - 4.5" x 20". A couple of weeks ago, I began making a second mini quilt from Tara Lynn Darr's mini quilt book, Simply Charming - Small Scrap Quilts of Yesteryear. This is the book that Darlene and I are using for the Simply Charming Every Other Month Mini Quilt Along. Beginning in February of this year, we have invited all of you to join us in making a mini quilt from this book every other month, so when the end of 2013 is here, you will have six mini quilts to gift away, or enjoy for yourself. You choose the quilt to make, using fabrics of your choice. What could be simpler??? Because I love all of the mini's in this book, it took me a while to decide which one to make as my second mini from the book. After much debate, I decided on Nellie's Nine Patch. I'm using (primarily) a charm pack of Indigo Crossing, by Minick and Simpson for Moda. There's a little story behind this mini... on February 20th I was visiting some of my favorite blogs, and came upon Lesley's, The Cuddle Quilter. Lesley had just posted about her February Simply Charming mini. Lesley made Nellie's Nine Patch using 2 mini charm packs of Indigo Crossing. She hand quilter her mini, and her hubby made a vintage doll cradle for it. I had just finished cutting what I needed to begin making the same mini, with the same fabrics, so I teased Lesley that we both have great taste when it comes to choosing mini quilts and fabrics! (Visit Lesley's post about it here). I hope to have Nellie's Nine Patch finished soon. I've already decided on my next Simply Charming mini quilt... it will be Off the Beaten Path ... I'm using charm packs of Collection for a Cause - Friendship, for this pattern. If you are "playing" along with Darlene and I in the Simply Charming Every Other Month Mini Sew Along, you can link here. Be sure to link to the post in your blog that will take viewers directly to that post. You will have until March 10th to do this. Come on quilters... we want to see your Simply Charming mini quilts!! !